Regarded by the local people as the heartland of the Nama culture, the little town of Kuboes lies nestled between the mountains of Kuboesberg to the north, Van der Stel Berg to the east and the Ploegberg to the south. The origin of this town can be traced back to recent history with the establishment of the Rhenish Missionary Church. The nomads of the Richtersveld would commute for miles in order to attend church services and to enable their children to be educated, until more missionaries came, and the itinerant population decided to settle in Kuboes itself and commute between stock posts. 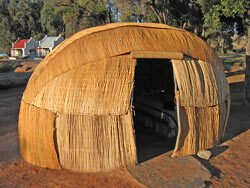 Kuboes� church became one of Richtersveld�s first permanent settlements, in a time when people still had a nomadic lifestyle. Reverend Johan Hein, teacher and evangelist, began his work here in 1844 and established the landmark Rhenish Church in 1893. The local school, once situated under trees, still bears his name. Since most of the locals spoke the Nama language, a wondrously soft tongue of clicks and clacks (that may sound like the language of the San to the untrained ear), Reverend Hein relied on an interpreter, Andries Domorogh, whose family still lives in Kuboes. This is the only school in the world that teaches the Nama language. It also does valuable work in preserving the Nama culture. The young students have exhibited their Nama Stap (�Nama Step�) dances on stages internationally, and are taught beautiful Nama poems and stories. Performers in Kuboes are both old and young. The village boasts choirs and dancers, who perform both traditional and contemporary scenes, many highly spiritual in nature. A life-giving mist from the far off sea sometimes happily interrupts the harsh and dry climate of Kuboes where temperatures soar to over 40�C in summer. The Namas familiarly know this phenomenon as �hurries� or �malmokkie�. Rolling in from the coast, the malmokkie is crucial to refresh the ecosystems inland. Walking in this area is almost like walking on another planet. Plants jutting out of rocks, bright blue lizards creeping under bushes, tiny multicoloured birds flitting between the �kokerbome� (quiver trees), myths told under a starlit sky are the order of the day or night. Fred Cornell was a pioneer, explorer and prospector who spent quite some time in the Richtersveld at the start of the 1900s, and wrote the fascinating book entitled �The Glamour of Prospecting�. In his honour a famed hill was named Cornellskop. The site, just a few kilometres from Kuboes, hosts the largest population of the endangered Baster Quiver Tree in the world. Cultural groups: Often called the heartland of the Nama culture, Kuboes offers traditional meals, Namastap, dancing, singing and music. Historical church buildings: The reminders of the origins of Kuboes as a mission station started by Rev. Johan Hein in the late 1800s. 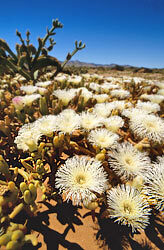 Cornellskop: A 30ha hill hosts the largest population of the most threatened species of Succulent Karoo vegetation in Namaqualand, the Baster Quiver Tree. Wondergat: This mysterious sinkhole is the source of many local legends and said to be the home of the Big Snake.